After six movies, one has to wonder what’s really so impossible about these missions. Then again, 56-year-old Tom Cruise has been at this since 1996, so maybe it’s less the missions and more the person doing them. The Mission: Impossible film franchise had a bit of a rocky start, and didn’t hit its stride until the third movie. But since then, it’s been going nowhere but up. But one can only go so high until there’s Fallout. Ethan Hunt (Tom Cruise) is ordered by IMF to recover three plutonium cores from a terrorist group known as The Apostles. But when one of their own gets taken hostage, Hunt sacrifices the plutonium to save his team-member’s life. Upon learning who has the plutonium now, Hunt assumes the identity of a mysterious buyer named John Lark. And the price for the plutonium? “John Lark” must break a convicted terrorist out of prison; none other than Ethan Hunt’s former adversary, and leader of The Syndicate, Solomon Lane (Sean Harris). 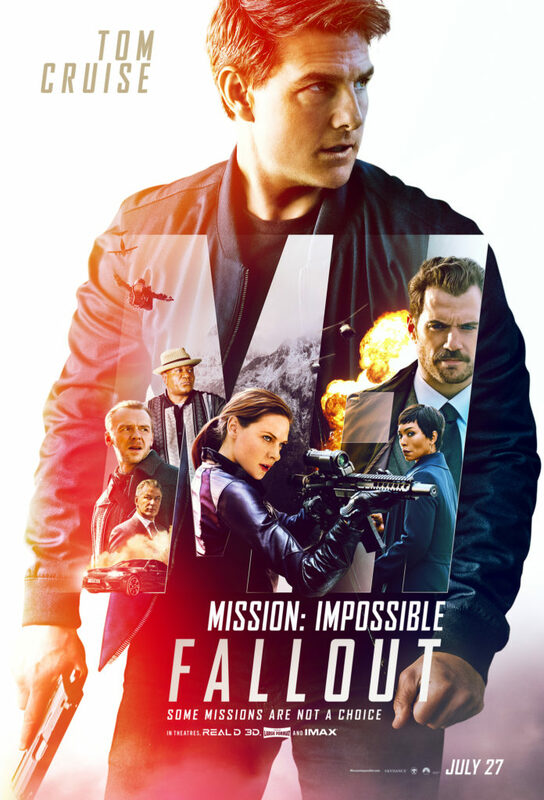 Mission: Impossible – Fallout was marketed as a major turning point for the franchise, suggesting Ethan Hunt goes rogue after reaching his limit with IMF. Nothing could be further from the truth. Ethan Hunt is his usual, loyal, insane-stunt self, sacrificing anything and everything to save as many lives as he can. The movie may toy with occasional dialogue bits that Hunt isn’t pleased with the way things are being run, but at no point is any disloyal line ever crossed or even touched. Another tactless move is the inclusion of the CIA’s supervisory Agent Walker (Henry Cavill). He’s huge and intense; I’ll give him that. He’s the CIA thorn in the IMF side. But Walker’s character arc is so painfully predictable that it borders on cinematic criminality. On the plus side, every returning cast member, from Luther (Ving Rhames), to Benji (Simon Pegg), to Ilsa Faust (Rebecca Ferguson), are top-notch in every single one of their scenes. Solomon Lane, who I felt was an underwritten villain in the last entry, is only slightly improved here, but his character still needs more work. The real show-stealer, as always, is the ever-electrifying Tom Cruise. Like a total pro, he gives no less than 100%. Whether he’s sprinting across rooftops, arguing with his superiors, or making quick decisions under pressure, you find yourself rooting for him on every step of his journey. The death-defying stunts are there as always, but it’s the impossible choices he’s forced to make that really show off how good a good-guy he is. I don’t usually like to weigh the quality of a movie against its marketing, but when your expectations go sideways instead of the usual up or down, it can’t be helped. The reason I bring it up at all is because there’s nothing in this movie that helps it stand out from the rest of the Mission: Impossible franchise. Instead of going in a completely new direction (as its marketing implied), it sticks rigidly to the tried-and-true formula to deliver a paint-by-numbers experience. (“Franchise fatigue”, they call that.) After a tedious first entry, a cartoonish sequel, and then three great sequels in a row, Fallout is only good, but never great. You’ll enjoy it for sure. Just not as much as the last three.